In our custom base layout, we add the site’s navigation header. We use the <nuxt-link> component to generate links to the routes we want to have on our blog. You can check out the docs on <nuxt-link> to see how it works. The <nuxt> component is really important when creating a layout, as it displays the page component. It’s also possible to do a couple of more things — like define custom document templates and error layouts — but we don’t need those for our simple blog. I urge you to check out the Nuxt.js documentation on views to see all the possibilities. 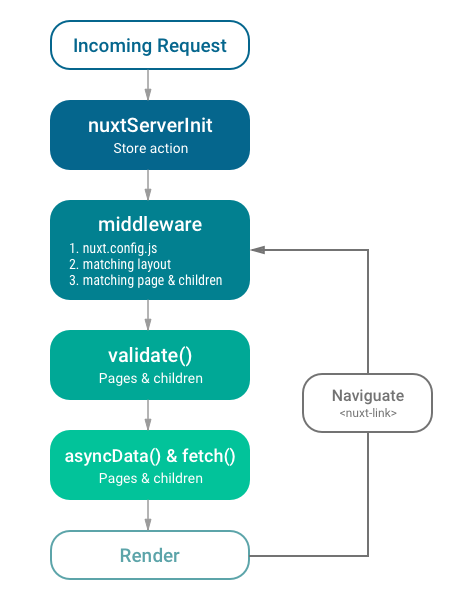 Pages in Nuxt.js are created as single file components in the pages directory. Nuxt.js automatically transforms every .vue file in this directory into an application route. As stated earlier, specifying the title option here automatically injects its value into the titleTemplate value before rendering the page. We can now reload our app to see the changes to the homepage. Another great thing about Nuxt.js is that it will listen to file changes inside the pages directory, so there’s no need to restart the application when adding new pages. Now, we can visit http://localhost:3000/about to see the about page, without having to restart the app, which is awesome. Our current homepage is pretty bare as it is, so we can make it better by showing the recent blog posts from the blog. We’ll do this by creating a <posts> component and displaying it in the index.vue page. Note: Ideally the posts should be retrieved from an API or resource. For example, Contentful is a service that can be used for this. We import the posts data from the saved JSON file and assign it to the posts value in our component. We then loop through all the posts in the component template with the v-for directive and display the post attributes we want. Note: The ~ symbol is an alias for the / directory. You can check out the docs here to see the different aliases Nuxt.js provides, and what directories they’re linked to. Now we’ll add dynamic routes for the posts, so we can access a post for example with this URL: /post/1. Validate the route parameter with the validate method. Our validate method checks if the route parameter passed is a number. If it returns false, Nuxt.js will automatically load the 404 error page. You can read more on it here. The asyncData method is used to fetch data and render it on the server side before sending a response to the browser. It can return data via different methods. In our case, we use a callback function to return the post that has the same id attribute as the route id parameter. You can see the various ways of using this function here. As we’ve seen before, we use the head method to set the page’s headers. In this case, we’re changing the page title to the title of the post, and adding the post summary as a meta description for the page. Next, we can generate the static HTML files for our pages. We’ll need to make a minor tweak though, as by default Nuxt.js ignores dynamic routes. To generate the static files for dynamic routes, we need to specify them explicitly in the ./nuxt.config.js file. You can check here for the full documentation on using the generate property. Nuxt saves all generated static files to a dist folder. As a final step, we can take advantage of hosting by Firebase to make our static website live in a couple of minutes. This step assumes that you have a Google account. This should open a browser window and prompt you to sign in. Once you’re signed in, visit https://console.firebase.google.com and click Add project. Make the relevant choices in the wizard that opens. Once the project is created, go to the project’s hosting page at https://console.firebase.google.com/project/<project name>/hosting and complete the Get started wizard. In the wizard that appears, select “Hosting”. Then select your newly created project from the list of options. Next choose the dist directory as the public directory. Select to configure the page as a single-page app and finally select “No” when asked if you want to overwrite dist/index.html. Firebase will write a couple of configuration files to your project, then put the website live at https://<project name>.firebaseapp.com. The demo app for this article can be seen at nuxt-ssr-blog.firebaseapp.com. If you run into problems, you can find full instructions on Firebase’s quickstart page. The Nuxt.js framework is really great. It’s even recommended in the official Vue.js SSR GitBook. I really look forward to using it in more SSR projects and exploring all of its capabilities.